News and commentary on the autism epidemic and my beautiful boy who is living with autism. To say that this has been an active couple of days for information would be quite the understatement. For years we have been asking the question, "Why is America so OK with the corruption that is destroying our children, and our country?" Well I get the sense that at long last, they aren't. Two of the most curious pieces of information that came to our attention yesterday, are the fact that CDC scientists are so sick of the corruption in their own agency that they have formed a group to call for a clean up, and that CDC has called for public comment on the MMR vaccine. I can't help but think that these two things might be strongly associated. CDC is corrupt to the bone. We all know it, and people associated with the agency can sometimes barely contain their contempt for vaccine injury parents who are speaking truth to power. As demonstrated by #Flipper and his friends on Friday during the protest outside the CDC headquarters in Atlanta. Well now we know that there is a backlash in play against the CDC's culture of corruption, and while those angry at the bosses for selling out science and sound health policy are not yet ready to put their names on their position for fear of reprisals, they have spoken out. "A group calling itself CDC Scientists Preserving Integrity, Diligence and Ethics in Research, or CDC SPIDER, put a list of complaints in writing in a letter to the CDC Chief of Staff and provided a copy of the letter to the public watchdog organization U.S. Right to Know (USRTK). The members of the group have elected to file the complaint anonymously for fear of retribution. On the same day, CDC has announced that they are taking public comment on the MMR vaccine? Of all things?? Of all times??? They are doing this now?????? AGENCY: Centers for Disease Control and Prevention (CDC), Department of Health and Human Services (HHS). ACTION: Notice with comment period. vaccine information materials that all health care providers are required to give to patients/parents prior to administration of specific vaccines. HHS/CDC seeks written comment on the proposed updated vaccine information statements for MMR (measles, mumps, and rubella) and MMRV (measles, mumps, rubella, and varicella) vaccines. DATES: Written comments must be received on or before December 19, 2016." They are fully under assault for their corruption in the Thompson scandal for withholding links between the MMR and autism, while a federal lawsuit is showing that Merck faked their efficacy data on the Mumps component of the vaccine... AND THEY ARE SUDDENLY ASKING FOR PUBLIC COMMENT? WHAT!!?? We are going to go ahead and roll over and show you our soft, vulnerable underbelly on an official platform. Fire at will. Why in the world would CDC give us an official open door to do this? Might it be that the rank and file are sick of the corruption too, and are leaving the the latch open for the barbarians to storm the gate? Why set us up to spike the ball? Why invite us into the walled city? Why give me so many opportunities to come up with metaphors for inviting their own doom? The hopeful mom in me wants to believe it is because the people inside have decided that enough is enough, and they want a graceful way to start the process of restoring reliability and credibility to the agency, and soundness to their policy. The Warrior Mom in me says, "STORM THE GATES!!!!! I WANT EVERY DAMN FAMILY WITH ANY DAMN MMR INJURY STORY TO UNLOAD ON THESE PEOPLE! I WANT THIS TO BE THE BIGGEST TRUTH OUTING ON THIS VACCINE EVER! IF YOU DON'T TELL THEM EVERYTHING YOU NEED TO TELL THEM ABOUT THIS VACCINE AND WHAT IT HAS DONE TO YOUR CHILD AND YOUR FAMILY, THEN I DON'T EVER WANT TO HEAR THE WORD VACCINE COME OUT OF YOUR MOUTH AGAIN!!" Things are Different Now. It is Time to Act Differently Now. Today the Virginia bill to remove vaccine exemptions was dead on arrival, and withdrawn by the sponsor. Yesterday I wrote that this year was not like last year, that we are the powerful force now, and that was proved to us in one 8 minute hearing in the VA legislature. It is time to realize that WE are the powerful force now, not THEM. On Tuesday, Ben Swann made the Thompson documents public and gave adetailed explanation of what they meant. FROM THAT MOMENT ON THIS BECAME OUR GAME. We have intercepted the ball, and it is time to move from defense to offense, but I don't think we have realized that. Realize it. Tim Keller is one of my favorite pastors. He is that rare bird that is a conservative preacher that actually understands the plight of the oppressed. He has a sermon where he explores why, more than a generation after all laws oppressing blacks in the US were repealed, that they still suffer and struggle. One of his points is on the phenomenon that some older black Americans still seem to defer to their white counterparts, even while holding deep resentment toward them. He describes a man, living under Jim Crow his whole life, calling every white man he meets on the street, "Sir." But when he suddenly acquires all the legal rights of those to whom he has had to defer, and whom may have owned his ancestors, he is still, in his heart, the man who calls them, "Sir." He has been lied to from birth that he is less than, and unlearning that lie, even when one wants to, is a difficult task. How hard it is to become healed and free when one can't cast off the lie of the oppressor that was used to keep a group oppressed. 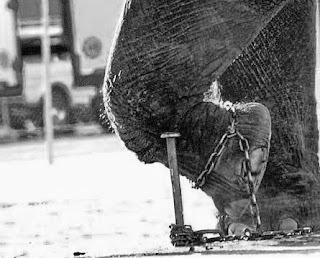 The elephant who had his ankled chained to a staked in the ground when he was a 200 lb baby, will still believe that same small ankle chain and stake in the ground can prevent him from walking away when he is a full grown 6,000 lb elephant. This is where we are today. We have been the powerless for so long that we are at risk of not realizing that we are the powerful now. It is time for us to cast off the lie that we have no power. Because we are the ones who have the power now. That Virginia bill sponsor pulled the bill because she could not win. And at this point, THIS WILL BE THE NORM. California SB 277 will not stand. It cannot survive the truth we now have, because THEY have been so foolish as to give us a way to get back into a court room. 2016 is the year of GO! We don't need to spend time complaining on facebook about our legislators, or Autism Speaks, or the AAP or the AMA or the CDC or Pharma... it is time to brush aside those like the trolls, the media, and the Autism Speaks of the world who have tried to get in between us and those who are corrupt and harming our children, and to straight at those who are the true evil doers here. Ours is no longer a spirit of fear, but of power and of love and of a sound mind. So look down at your leg and realize you are not wearing a chain binding you from moving, you are wearing an anklet that is merely a symbol of their failing ATTEMPT to chain you down. You are now mature and powerful. You are now a 6,000 lb elephant. But a caution to be as wise as that elephant, too. We must be sober, serious and respectable. We must be above reproach. We must be unassailable in our claims. We must treat one another with all due respect and we must be respectful of the uncorrupted officials whom we will be coming before. They have been blinded, and it is time for them to see the light. Proverbs 24: 17-18Do not rejoice when your enemy falls,And do not let your heart be glad when he stumbles;Or the Lord will see it and be displeased,And turn His anger away from him. I will repeat again what I have been saying for a month now, I believe that this is a spiritual problem, a problem of the heart, and that the blindness of the majority in our country to this evil now requires a spiritual solution. If it were merely a matter of truth and reason, this would have been properly addressed in 1999 when it came to light. It has been kept in place and been doing untold damage to our population internationally, because of darkness and lies, and the thing that will change it, that is changing it, is God opening eyes and humbling hearts to face this difficult truth. It was Thompson's grief and conviction over his wrong doing that finally opened up the truth through official channels. I believe it will continue to be humility, love and fearlessness that will allow the dominoes to continue to fall, and lead to truth, healing and reform. So if you are a believer, and even if you are not, but are open, to sit down and seek God on this issue, and for yourself. Therefore I, the prisoner of the Lord, implore you to walk in a manner worthy of the calling with which you have been called, with all humility and gentleness, with patience, showing tolerance for one another in love, being diligent to preserve the unity of the Spirit in the bond of peace. There is one body and one Spirit, just as also you were called in one hope of your calling; one Lord, one faith, one baptism, one God and Father of all who is over all and through all and in all. (Now this expression, “He ascended,” what does it mean except that He also had descended into the lower parts of the earth? He who descended is Himself also He who ascended far above all the heavens, so that He might fill all things.) And He gave some as apostles, and some as prophets, and some as evangelists, and some as pastors and teachers, for the equipping of the saints for the work of service, to the building up of the body of Christ; until we all attain to the unity of the faith, and of the knowledge of the Son of God, to a mature man, to the measure of the stature which belongs to the fullness of Christ. As a result, we are no longer to be children, tossed here and there by waves and carried about by every wind of doctrine, by the trickery of men, by craftiness in deceitful scheming; but speaking the truth in love, we are to grow up in all aspects into Him who is the head, even Christ, from whom the whole body, being fitted and held together by what every joint supplies, according to the proper working of each individual part, causes the growth of the body for the building up of itself in love. So this I say, and affirm together with the Lord, that you walk no longer just as the Gentiles also walk, in the futility of their mind, being darkened in their understanding, excluded from the life of God because of the ignorance that is in them, because of the hardness of their heart; and they, having become callous, have given themselves over to sensuality for the practice of every kind of impurity with greediness. But you did not learn Christ in this way, if indeed you have heard Him and have been taught in Him, just as truth is in Jesus, that, in reference to your former manner of life, you lay aside the old self, which is being corrupted in accordance with the lusts of deceit, and that you be renewed in the spirit of your mind, and put on the new self, which in the likeness of God has been created in righteousness and holiness of the truth. Therefore, laying aside falsehood, speak truth each one of you with his neighbor, for we are members of one another. Be angry, and yet do not sin; do not let the sun go down on your anger, and do not give the devil an opportunity. He who steals must steal no longer; but rather he must labor, performing with his own hands what is good, so that he will have something to share with one who has need. Let no unwholesome word proceed from your mouth, but only such a word as is good for edification according to the need of the moment, so that it will give grace to those who hear. Do not grieve the Holy Spirit of God, by whom you were sealed for the day of redemption. Let all bitterness and wrath and anger and clamor and slander be put away from you, along with all malice. Be kind to one another, tender-hearted, forgiving each other, just as God in Christ also has forgiven you. Looking For Information on How To Vaccinate More Safely? "No Evidence of Any Link"
The Most Dangerous Question in Public Health: "What can you tell me about vaccine encephalopathy?" Autism Mom, Writer, Speaker, Advocate, Activist, Therapist, Conservative, Christian. October 18, 2003: Andy Scott Called for a Strong National Autism Strategy; Will October 19, 2015 Deliver A Government That Will Make It Happen?